Cloud computing is changing how businesses access and use technology to innovate. It facilitates sharing of applications across the organization through various systems and collaboration on key issues and tasks. Cloud computing also enables organizations to scale resources up or down depending on the needs of the moment without having to invest in hardware or manage the infrastructure. For these reasons, it has become a popular alternative to installing and main-taining information systems on-premises. Data and analytics increasingly are being moved to the cloud as well. Analytics systems that reside in the cloud can help provide access to data sources beyond the company firewall for use in business processes and decision-making. However, our benchmark research finds that both data and analytics deployed in the cloud, especially for use by front-office functions such as marketing, are fragmented rather than inte­grated, in disparate systems relying on siloed data from suppliers and locations. Unless organiz­ations integrate their arrays of cloud-based data with data stored on-premises, this data fragmentation and subsequent discon­nected reporting can produce dissatisfaction with cloud-based analytics. 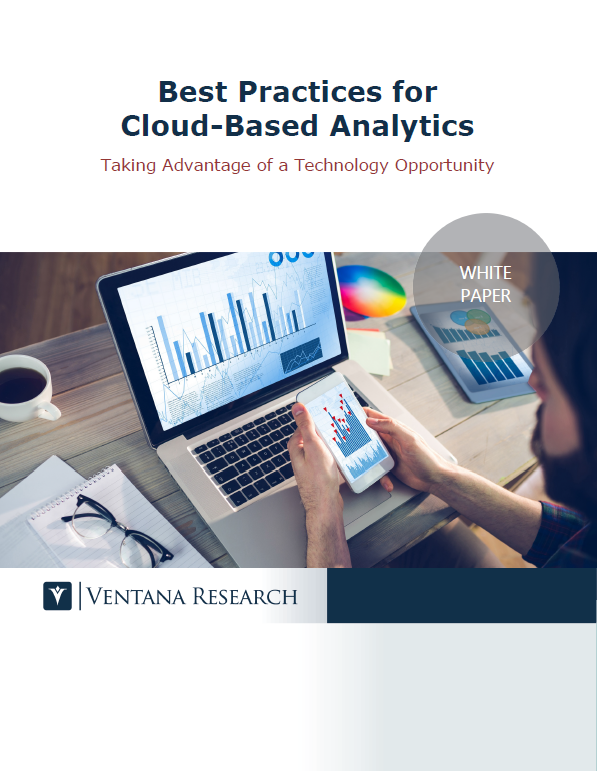 Download the best practices and ensure you're getting the most out of your cloud-based analytics.